Customer experience may be the next competitive battlefield for businesses, but it has a long way to go before it delivers on the lofty expectations of CEOs and customers. Today your ability to deliver better customer experiences is hamstrung by your fragmented and siloed view of your customer relationships. Until your people and applications can see and manage a total view of every customer relationship, they just won’t be customer ready. 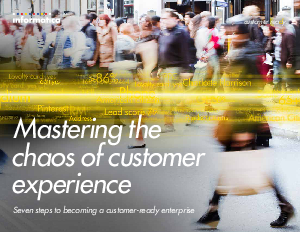 Read Mastering the Chaos of customer experience and find out what you can do about it. If customer experiences matter to your business, you won’t want to miss this eBook.